On 15-26 February SCIT hosted Mr. Peter McCarey, Chief of Language Services in the World Health Organization (WHO). He held a series of master classes where he acquainted the students with specific aspects of work at WHO. The students translated and jointly edited several texts from the WHO workflow. Mr. McCarey’s master classes coincided with the students’ participation in the veterinary conference and the thematic seminar on medical translation led by Mr. Mikhail Demidov, SCIT graduate. It is the first time that SCIT students have got such intensive training in medical translation and interpreting. As long as Mr. McCarey is widely involved in literary work and has authored a novel, a volume of poems, a book of essays on language, translation and philosophy and several critical works, he also dared students to translate a poem into English. Sergei Zavjalov’s poem on the war theme was simultaneously simple and complex: the poem’s varying stylistic modes were compensated for by its repetitive structural pattern. On 8 – 26 February SCIT hosted Jonathan Clements, FAO interpreter. Over three weeks he gave master classes in consecutive and simultaneous retour as well as sight translation to SCIT students. In preparing for the classes the students learned a lot about FAO, its agenda and the specificity of texts and speeches there. The master-classes in retour into English with a native speaker highlighted the students’ problem areas and gaps in their mastery of retour. Moreover, as an experienced interpreter Jonathan shared his secrets on interpreting technique and provided a lot of valuable advice. In addition, students from the Bachelor’s and Master’s programs at the Institute of Foreign Languages could also attend Jonathan’s classes. Our guest was also an active participant in SCIT events concurrent with his visit. He took part in a Welcome Day, attended lectures given by SCIT professors and actively practiced his Russian with the SCIT students. Jonathan Clements’ master classes took place under the Memorandum of Understanding with FAO. Another aspect of cooperation with FAO is graduate internships. Currently Marina Tkacheva, SCIT graduate 2015, is working with the FAO translator team in Rome. We hope Herzen University will continue and further broaden its cooperation with this organization. Recently Irina Alexeeva, SCIT Director, gave an interview to Fiodor Kondratovich, Director General of LLC “LingvaKontakt”. 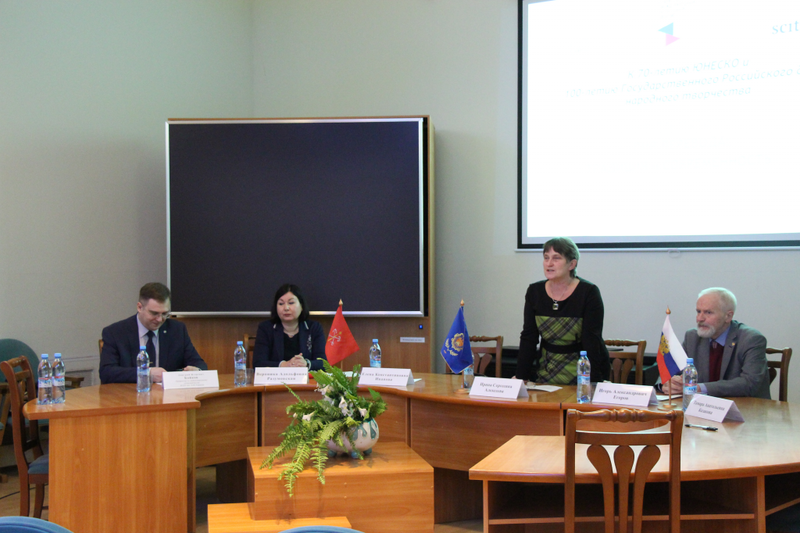 The colleagues discussed the topical issues of educating interpreters and translators, Irina Alexeeva spoke about the specificity of the training process at SCIT and the role of foreign languages in today’s world. From 1 to 8 February 2016 the School hosted Kirill Kasyanov, a senior interpreter from the Russian Interpretation Section at the UN Headquarters in New York who gave a series of master classes. During four days of rigorous work the students practiced their interpreting skills doing actual speeches from the UN meetings. Thanks to our guest’s professionalism every class became a unique experience in professional communication, and his criticism helped the students to understand and try to avoid the most typical mistakes of a simultaneous interpreter. 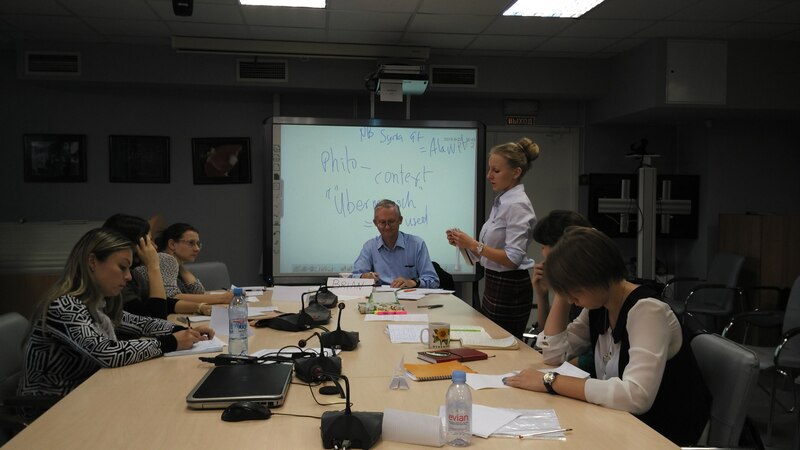 In addition to the English classes, Kirill Kasyanov gave a simultaneous master-class from Spanish into Russian. On 14 December 2015, as a fringe event of the IV St. Petersburg International Cultural Forum, the St. Petersburg School of Conference Interpreting and Translation organized a special event – a round table entitled Translation Feast: Tradition and Modernity. With the Year of Literature in Russia coming to its finale, this event brought together translation scholars and practitioners, including leading literary translators of Western, Oriental, and Slavonic literature. The round table provided an excellent opportunity for the discussion of the place and the role of literary translation in today’s Russian culture, providing a glimpse of the best examples of the art of translation. 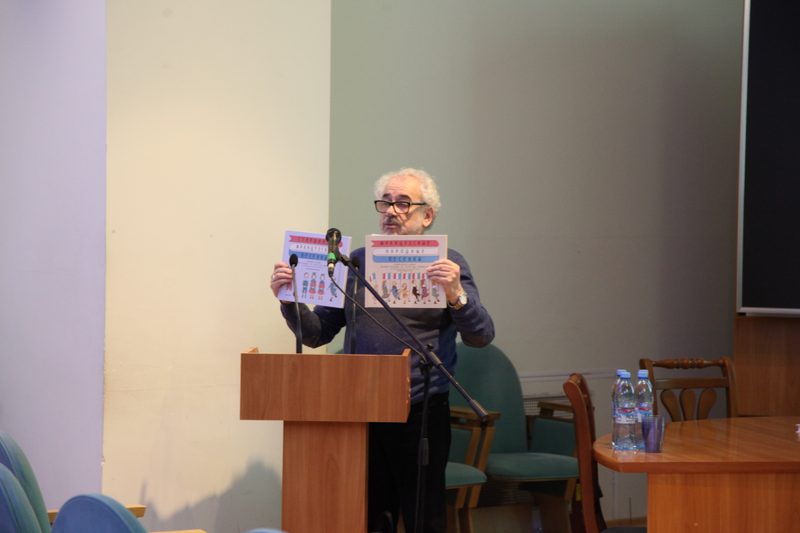 Theorists discussed the role of literary translation in contemporary Russian culture, and practitioners gave a recital of their latest translations. They definitely succeeded in delivering to their audience the music and imagery of languages as diverse as Arabic, Japanese, Slovenian, Mongolian, Spanish, Czech, Hungarian, Georgian, and Norwegian, among others. The round table attracted many Herzen University students and faculty, as well as other guests with an interest in literature and foreign cultures. It demonstrated that the best Russian translations extend the geographical reach and lifespan of the masterpieces of world literature. Translations also make understanding possible between distant cultural traditions, and allow for the creation of a favourable environment for the development of Russian culture itself. From 11 – 13 November, SCIT hosted Liam Long, an experienced interpreter and trainer from the Directorate General for Interpretation, European Commission. The master-classes were timed to coincide with the introduction of simultaneous interpretation at SCIT and aimed at developing basic skills in simultaneous interpreting. Each day was filled with intensive practice, the students spending up to five hours in class either interpreting or undertaking other tasks, such as making presentations, learning to evaluate and give constructive feedback on their peers’ performances. No doubt, working under the supervision of an accomplished SCIC interpreter has given the students new impetus to master the interpreting profession. 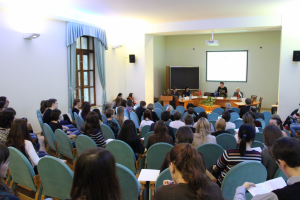 On 26 October – 13 November a series of master classes by Mikhail Kuzmenko, Senior Reviser of the Russian Translation Section, UN Office at Geneva, took place at the SCIT. His mission was to acquaint the students with the specifics of work at the United Nations, help them acquire hands-on experience of translating UN documents and prepare them for national competitive examinations for translators and editors. For three weeks the students translated and analyzed UN texts and studied institutional terminology. At the end of the training the students translated two official UN documents taken from the current workflow followed by feedback on mistakes and inaccuracies. 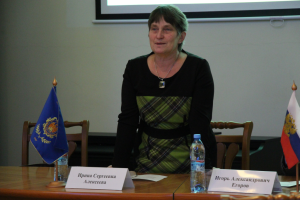 On 29-30 October, SCIT Deputy Director Angelique Antonova took part in the Translating Europe Forum 2015. This annual event was organized by the European Commission’s Directorate General for Translation and brought together all sides of the European family of translation. This year’s Forum was all about young people in translation. It brought forward ideas, projects, experiences and new approaches in translation. 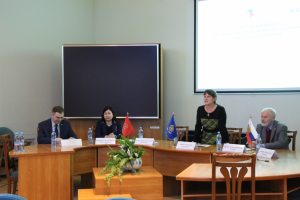 The Forum covered a range of translation-related areas, from localization at Google, translation of videogames, subtitling online courses, multilingual app development and much more. It also offered plenty opportunities for networking. 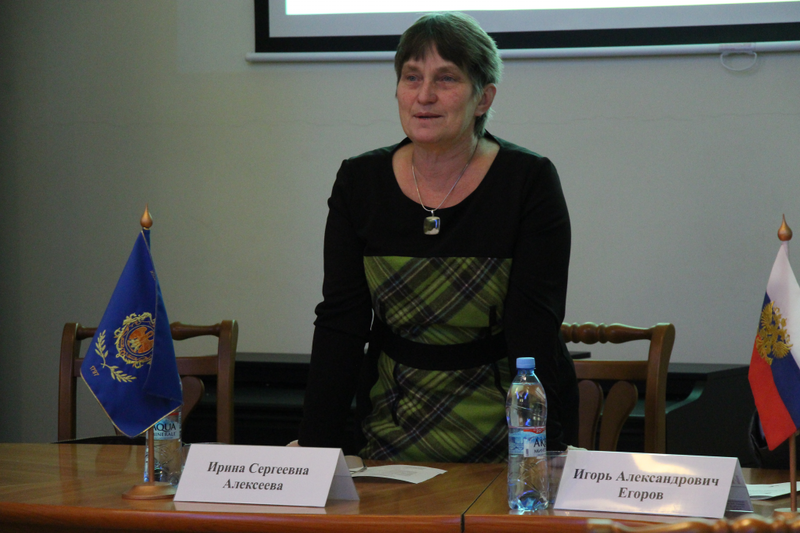 On 23 October SCIT had the first virtual conference with the European Parliament. The working languages were Russian, English and French. The students interpreted speeches about dieting and opinion polls in the consecutive mode with notetaking. The students coped well with the challenge. Observers from the European Parliament were satisfied with the result and did not point to any serious shortcomings in accuracy or completeness. The students are unanimous that the conference was useful – it was a good chance to test their ability under stress and a good challenge. On 7 – 9 October SCIT hosted Brian Gentle, EC interpreter. The objective of his mission was to introduce the basics of interpreting note-taking. With a month of active memory training behind, the trainees are now allowed to use notes. Guided by the expert, the students set to develop their own system of note-taking. Despite a voice problem, Brian Gentle managed to actively engage the students in work and conduct a series of English master-classes for each group, and a German class. Our guest’s professionalism and friendly attitude inspired the trainees in their determined efforts to improve their interpretation skills.